I have setup Eclipse 3.6.2 on Ubuntu 11.4 for AMD64 and Xdebug. Eclipse was installed with zip download from eclipse.org. PHP and Xdebug were setup with apt-get. When I run the PHP script in the shell they will use the /etc/php5/php.ini file and parse additional ini files in /etc/php5/conf.d/. When I run in Eclipse (run mode or debug mode) it will only parse php.ini and no additional ini files. Basically, all extensions, are not loaded. It is an intentional bug. 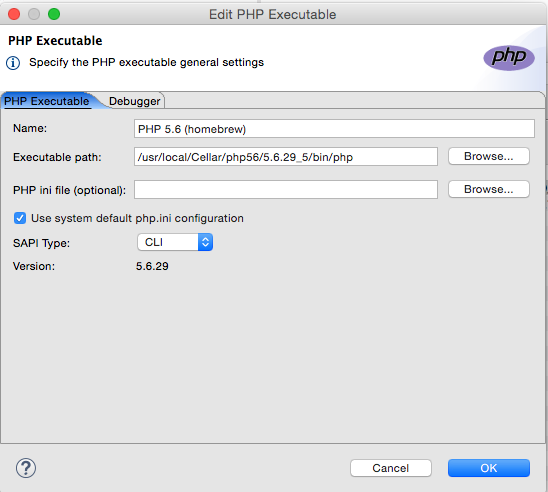 PDT executes php with "-n" option always. It makes additional ini files unavailable. The answer @atlanto gives as a work around did and does still work, but recent version of Eclipse (I'm on Neon) has a fix that may work for you if you don't mind using the php.ini and conf.d set by default for the php executable. The failing to load additional files only happens now if you put in an explicit php.ini file when defining a PHP executable. Leave this blank and check the box Use system default php.ini configurate. Now if you use the location/php.ini that was specified as default when the executable was built, it will respect scanning of conf.d directories. php -i "(command-line 'phpinfo()')" | grep "Configure Command"
Not the answer you're looking for? Browse other questions tagged php eclipse ubuntu xdebug eclipse-pdt or ask your own question. How do I set up PHP-debugging on Ubuntu 12.04 with Eclipse and XAMPP?